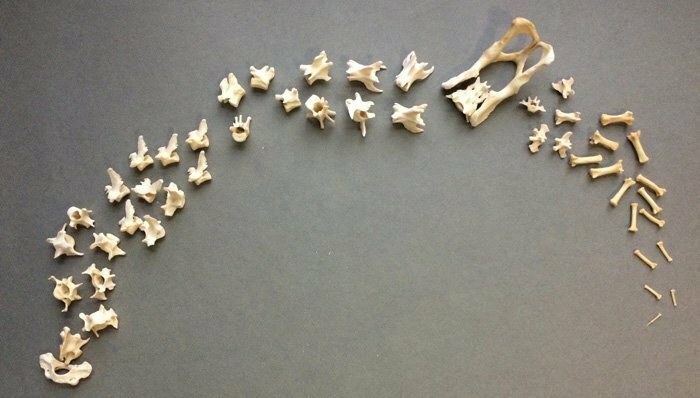 Articulation of a skeleton was the initial goal when I started this project. Little did I know what kind of adventure I was starting! For anyone just joining in on this adventure here’s a quick recap of what has already been accomplished. First I had to find a suitable subject. Second I had to actually collect the skeleton. Thirdly the skeleton was cleaned to prepare it for articulation. Now, it’s time for the real fun to begin. It’s time to put it all back together again and learn the fine art of articulation. I had to determine the posture of the fisher’s body before the process of articulation could begin. This was done by viewing numerous reference photographs and even a few videos on YouTube to determine how the fisher moves. The overview sketch does not have to be super fancy, it is primarily to determine major bony landmarks, positions of the limbs, determination of weight-bearing limbs and the angles of the major bones of the limbs. In preparing for articulation, I relied heavily on The Small Mammal Manual Manuscript by Lee Post. It is a very practical guide for anyone who gets bitten by the skeleton bug. There is a flow chart for building a skeleton included in the manual, and it provides some order to the process. It was recommended to start with the feet, but the teeny tiny bones were a bit too intimidating for me, so I started with the vertebral column first, then moved on to other areas once I became a little more confident. I really wanted to have the skeleton reflecting dynamic motion. Working from my sketch, I elected to show a gentle curve of the spine to the right. 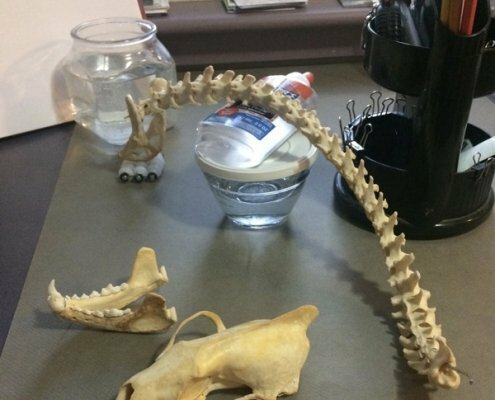 The curved spine helped suggest the skeleton was in motion and not in a rigid standing pose. Using my sketch as a guide, the articulation of the skeleton could finally begin. 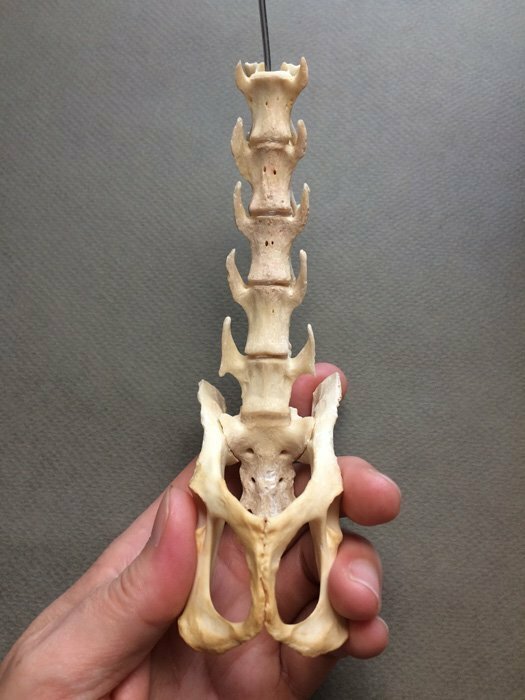 Sorting out the vertebrae was pretty straightforward. 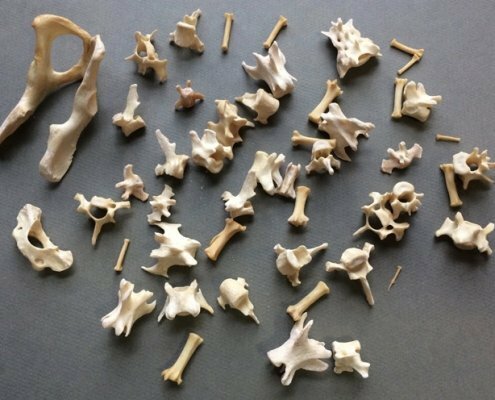 First sort them according to the region of the spine they come from: cervical, thoracic, lumbar, sacral and caudal. 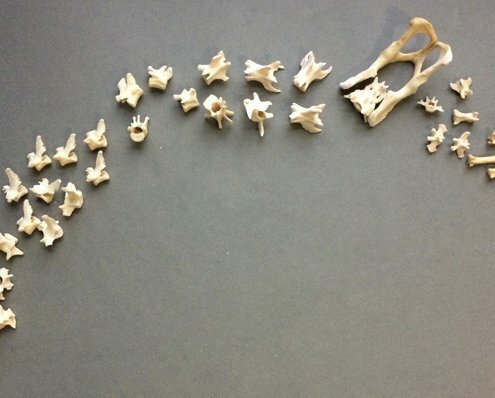 Second, once divided into groups, put the vertebrae into order within each group. By comparing certain features it was quite easy to figure out their order in relation to each other. Lastly, combine all the groups together from cervical to sacral to get an approximate length for the vertebral armature rod. 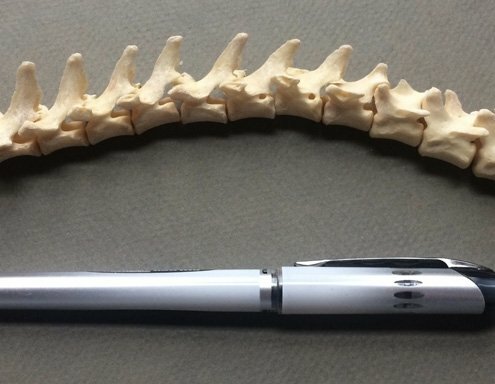 The vertebral armature rod is cut to length and bent to represent the curvature of the spine. 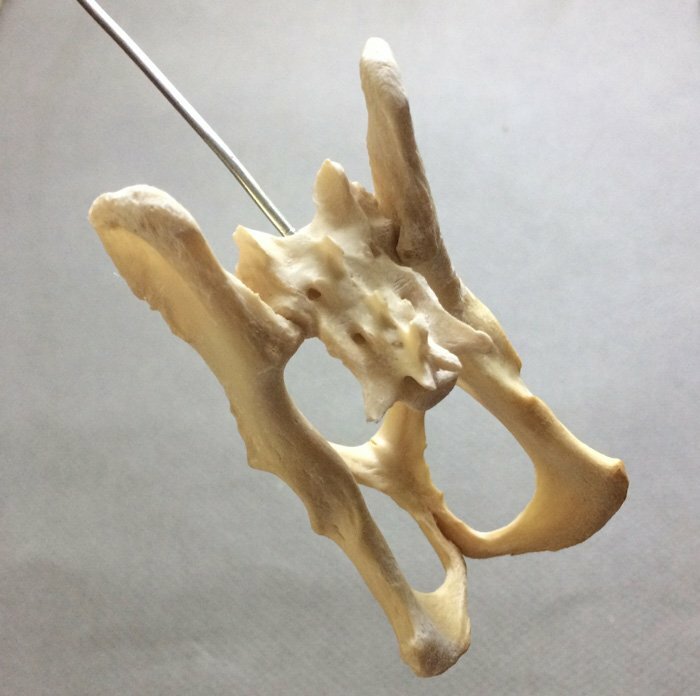 There are two methods to place the vertebrae onto the rod. 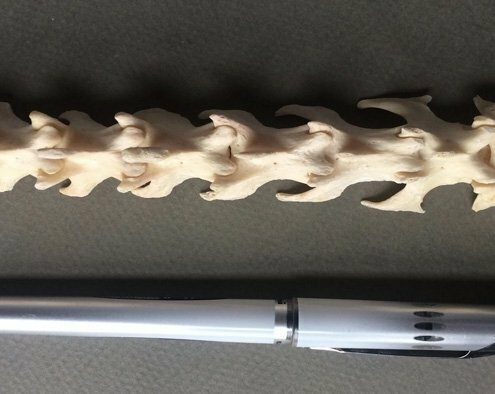 One is to drill a hole through the vertebral body large enough to accommodate the rod, then thread the vertebrae onto the rod. 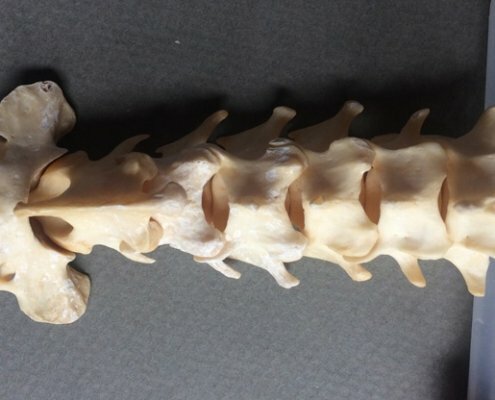 The other is to simply pass the rod through the vertebral foramen, and not drill the individual vertebrae. 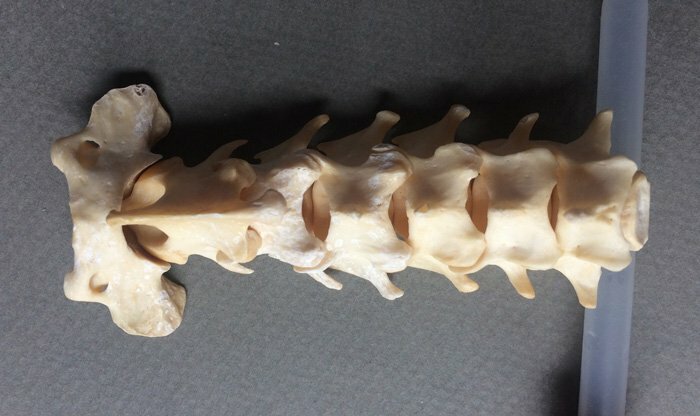 I elected the second method, mainly due to the smaller size of the vertebrae. 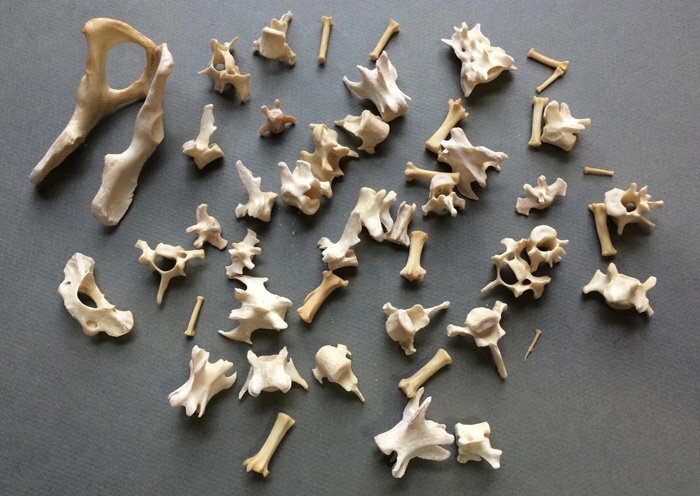 Once I decided to pass the rod through the foramen, it was fairly easy to assemble. 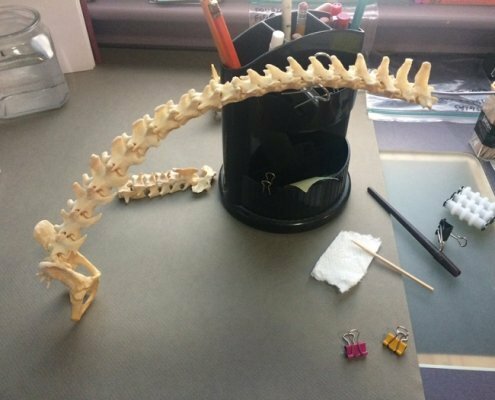 One end of the rod is placed into the vertebral foramen of the sacrum and glued in place. 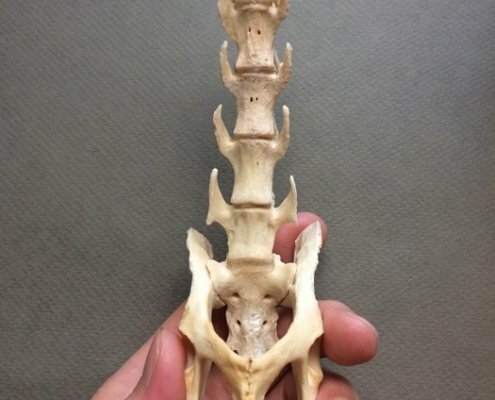 Once the rod is in place, the rest of the vertebrae can be slipped onto the rod one at a time. 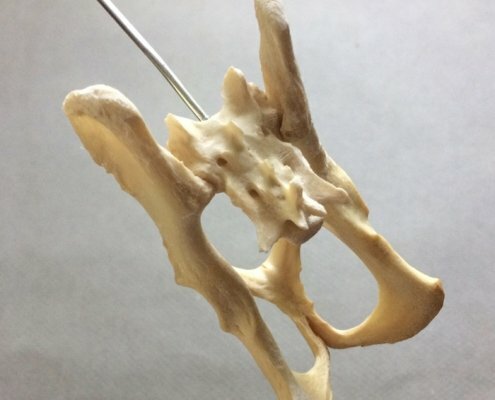 I used clear aquarium silicone to mimic the intervertebral disc between the vertebral bodies. It took a little trial and error to get it just right. While the silicone was setting between the vertebrae, I decided to start to assemble the skull. This involved sorting out where some of the loose teeth belonged and glueing them into place. 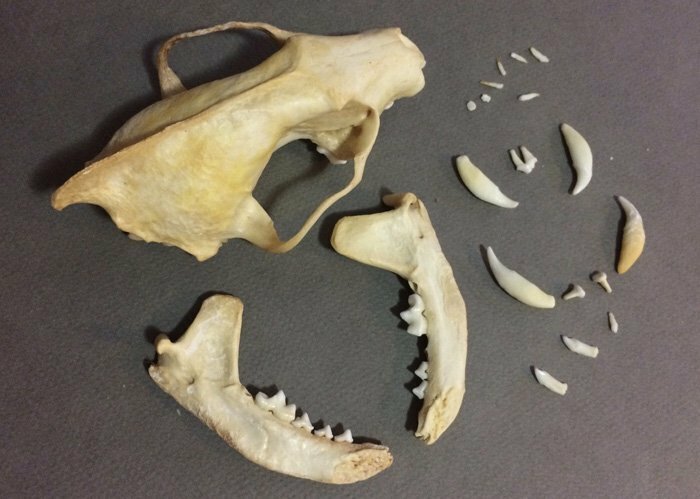 I also had to glue the two halves of the lower jaw together as they had split apart sometime during the cleaning process. Overall the skull went together pretty quickly. 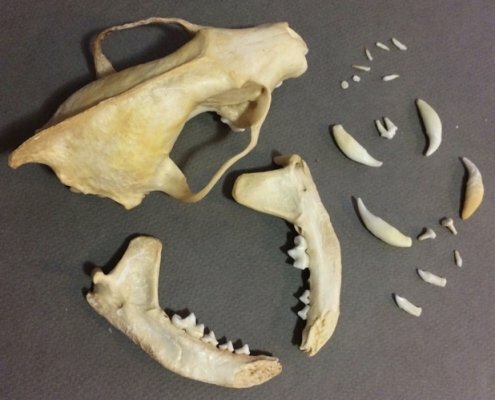 I was intrigued by the fact that the upper right canine tooth had been worn down dramatically on the front. 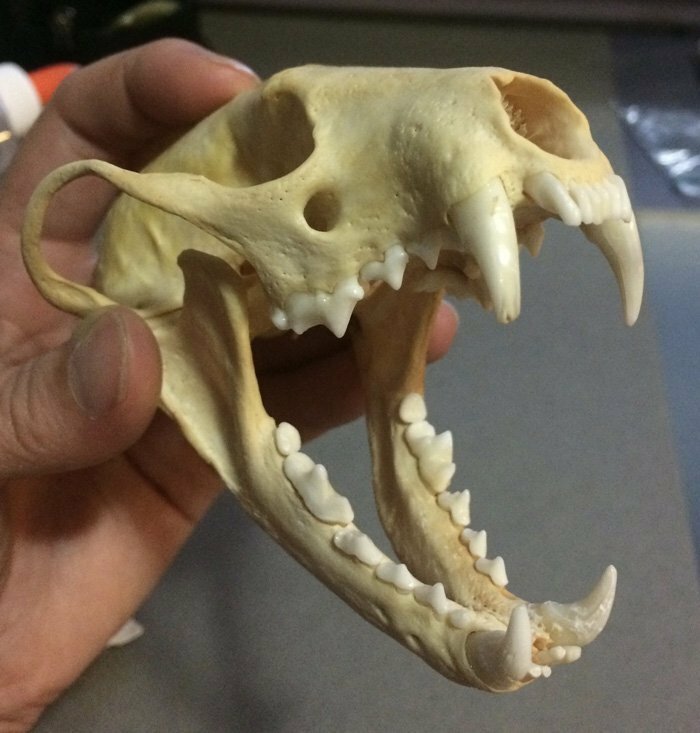 When I reviewed the original photos from the start of the project it was fairly clear to see there had been some malocclusion with the lower right canine. 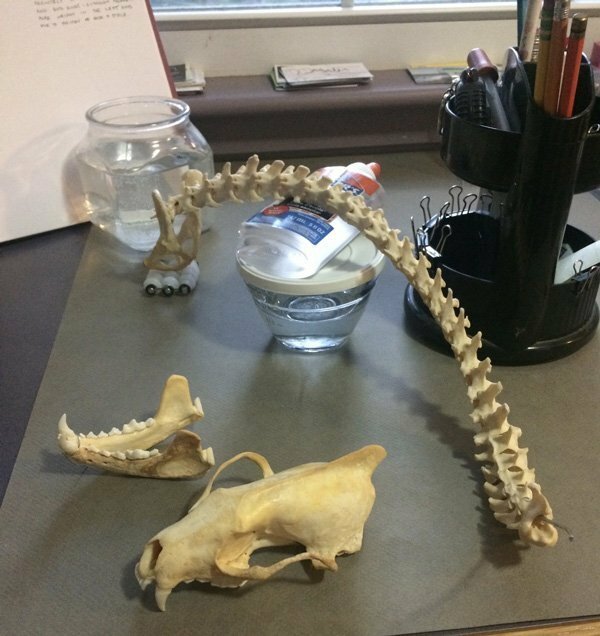 The next post in this series will discuss articulation of the front and hind limbs of the fisher skeleton. *I want to include a note about collecting specimens – make sure what you are collecting is legal to collect, there are a LOT of regulations about this, which I don’t want to get into here. 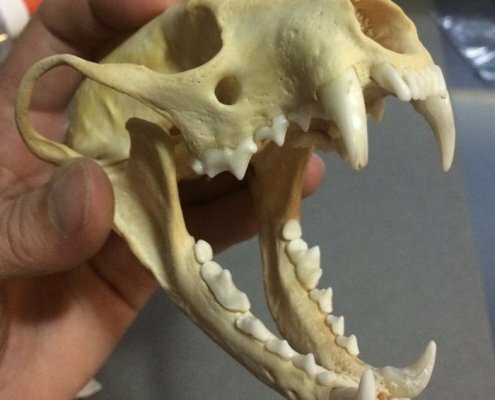 Please check with your state Department of Fish & Wildlife for any regulations regarding the collection and possession of the species you wish to collect. Better to be legal than fined!